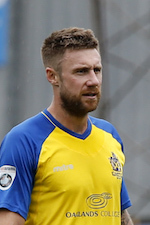 Creative midfielder David Noble agreed to join the club in August 2016. Noble was a free agent having been released by Exeter City in the summer and with over 300 football league appearances to his name, brings an abundance of experience and quality to the side. He began his career began as a trainee at Arsenal, with whom he won the FA Youth Cup in 2000 in a man of the match performance. A brief spell at West Ham United and Boston United followed before he moved to Bristol City for 80,000 GBP in January 2006 after enjoying a successful loan spell there. On 13 February 2007, he scored against Middlesbrough in the FA Cup Fourth Round Replay. But his most important strikes were the two goals he scored against Rotherham on 5 May 2007 which took Bristol City back into the Championship. Noble also scored in the Championship play-off semi-final against Crystal Palace, when his stoppage time strike from 30 yards gave Bristol City the advantage going into the second leg. Following his exploits at Ashton Gate he continued his journey west, joining Yeovil Town on loan in March 2009 before he signed for League One side Exeter City in the following January but was released after the Grecians were relegated in 2012. David signed for Rotherham United where he enjoyed two years in South Yorkshire before returning to his former club Exeter City in January 2015. He had previously made 12 appearances for the Grecians whilst on-loan with the club for the first half of the 2014-15 season. Nobles contract at St James Park expired in the summer of 2016 making him a free agent. David signed an 18-month contract with the Saints in December 2016 and in March 2017 became the club captain.